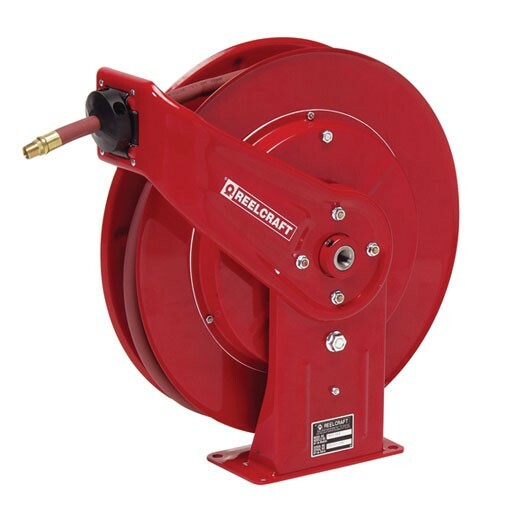 Reelcraft 4425OLP is a 1/4"x25' air and water reel with hose. Comes complete with hose and hose stop. 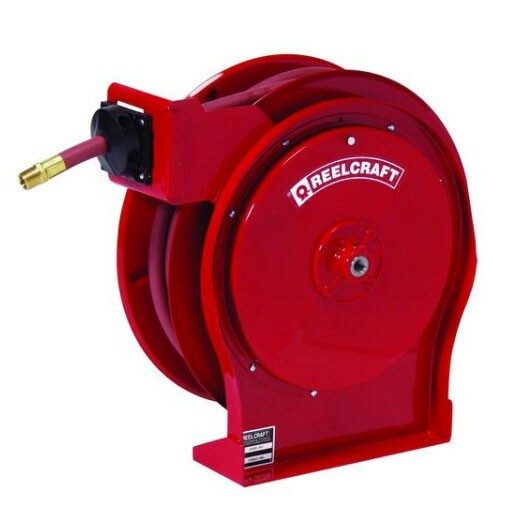 Reelcraft 7650OLP is an 3/8"x50' air and water reel with hose. 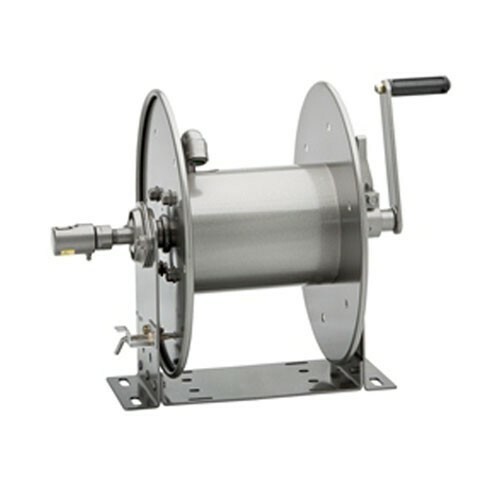 This robust reel is suitable for heavy duty applications. Comes with a 50' hose. 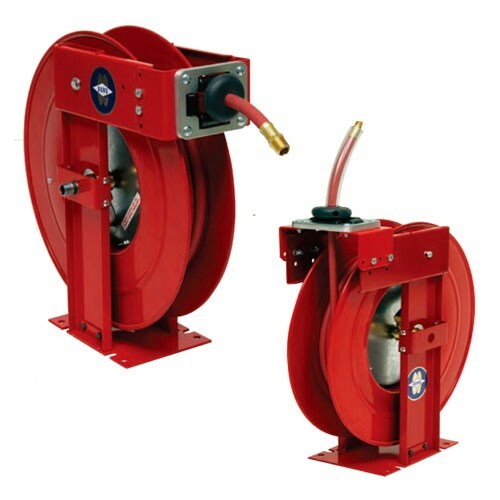 Duro Reels 1901 is a 3/8" X 50' Medium Duty Air and Water Hose Reel. Perfect for industrial and commercial shops, tire centers, automotive dealerships, service trucks and fleet maintenance facilities. 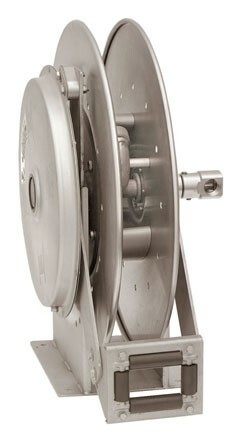 Duro Reels 1209 is a 3/8" X 50' Heavy Duty Air and Water Hose Reel. Hose reels with extra long lengths of hose. Duro Reels 1214 is a 1/2" X 50‘ Heavy Duty Air and Water Hose Reel with extra long lengths of hose. Duro Reels 1416 is a 3/8" X 35' Standard Duty Air & Water Hose Reel with Hose. Ideal for service station, garage, tire centers or factory where orderly dispensing of water or compressed air may be required. 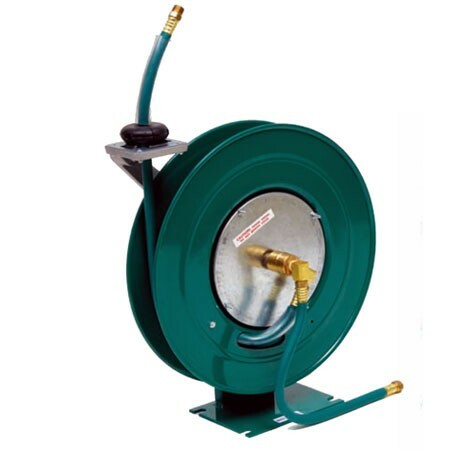 Duro Reels 1406 is a 1/4" X 50' Standard Duty Air and Water Hose Reel with Hose.Ideal for service station, garage, tire centers or factory - where orderly dispensing of water or compressed air may be required. Duro Reels 1404 is a 1/4" X 35' Standard Duty Air and Water Hose Reel with Hose. Duro Reels 1414 is a 3/8" X 25' Standard Duty Air and Water Hose Reel with Hose. Ideal for service station, garage, tire centers or factory - where orderly dispensing of water or compressed air may be required. Duro Reels 1418 is a 3/8" X 50' Standard Duty Air & Water Hose Reel with Hose. Ideal for service station, garage, tire centers or factory where orderly dispensing of water or compressed air may be required. 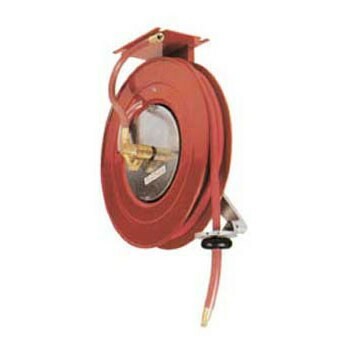 Duro Reels 1421 is a 1/2"" X 50' Standard Duty Air & Water Hose Reel with Hose. Ideal for service station, garage, tire centers or factory - where orderly dispensing of water or compressed air may be required. Duro Reels 1420 is a 1/2"" X 25' Standard Duty Air and Water Hose Reel with Hose. Ideal for service station, garage, tire centers or factory where orderly dispensing of water or compressed air may be required. Duro Reels 1203 is a 1/4" X 70' Heavy Duty Air and Water Hose Reel with extra long lengths of hose. Ideal for large service areas and industrial applications. Duro Reels 1211 is a 3/8" X 70' Heavy Duty Air and Water Hose Reel. Hose reels with extra long lengths of hose. Duro Reels 1213 is a 1/2" X 35' Heavy Duty Air and Water Hose Reel. Hose reels with extra long lengths of hose. 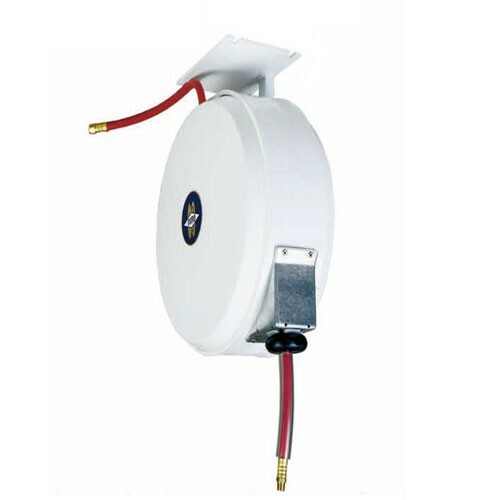 Duro Reels 1602 - 1/4" X 25' Single Enclosed Air and Water Hose Reel is ideal for service station lube rooms, service yard or pump islands, garage centers, commercial kitchens or dairies. 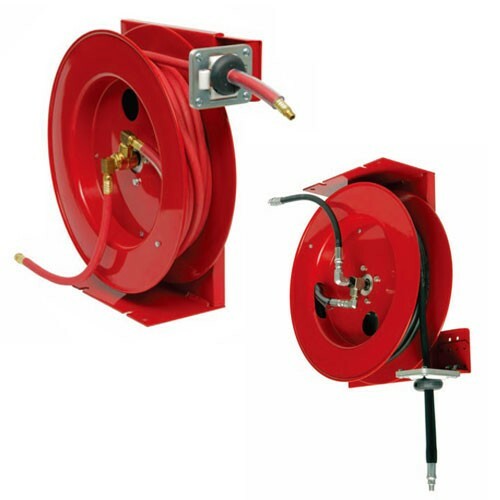 Duro Reels 1613-L 3/8" X 50' Single Enclosed Air and Water Hose Reel is ideal for service station lube rooms, service yard or pump islands, garage centers, commercial kitchens or dairies. 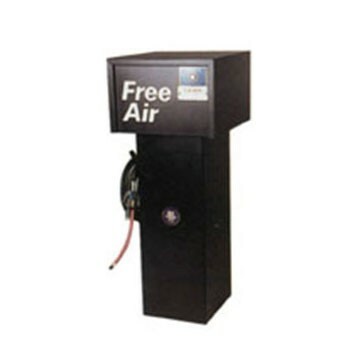 Duro Reels 93-A Wall Mounted Air Self Service includes a built-in compressor for free air. It comes standard with 25 feet of wire braid hose and an air gauge. Perfect for commercial or personal use. 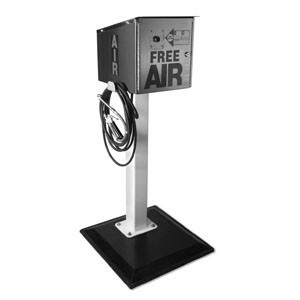 Duro Reels 95-A Pedestal Mounted Air Self Service includes a built-in compressor for free air. It comes standard with 25' of wire braid hose and an air gauge. Perfect for commercial or personal use. Ships in 30-37 Business Days! Hannay N818-23-24J is a 3/4" X 50' Spring Rewind Reels with Hose & Stop for use with water. The reel has a narrow frame and compact mounting base. Hannay N818-25-26B is a 1" X 50' Spring Rewind Reels with Hose & Stop for use with water. The reel has a narrow frame and compact mounting base. Hannay 1014-14-16-1/4 is a 1/4" X 100' Compact Manual Rewind Reels for use with pressure washing, washdown, spray operations, air. It is lightweight and compact. Hannay 1014-14-16-3/8 is a 3/8" X 75' Compact Manual Rewind Reels for use with pressure washing, washdown, spray operations, air. Hannay 1016-14-16-1/4 is a 1/4" X 150' Compact Manual Rewind Reels for use with pressure washing, washdown, spray operations, air. Lightweight and compact. Hannay 1016-14-16-3/8 is a 3/8" X 100' Compact Manual Rewind Reels for use with pressure washing, washdown, spray operations, air. It is lightweight, compact. Hannay 1020-14-16-1/4 is a 1/4" X 250' Compact Manual Rewind Reels for use with pressure washing, washdown, spray operations, air. It is lightweight, compact. Hannay 1020-14-16-3/8 is a 3/8" X 175' Compact Manual Rewind Reels for use with pressure washing, washdown, spray operations, air. Universal 1975-FA34-SS Air Tower is designed to operate in high heat and freezing conditions.